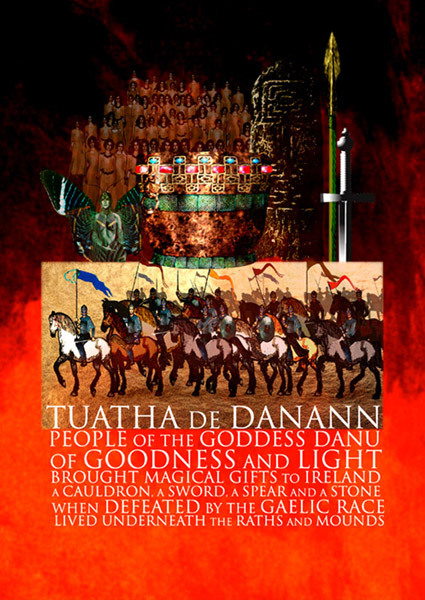 The Tuatha de Dannan ruled Ireland for a long time, and during that time, the land prospered. Summers were never too hot, nor winters too cold. The forests were bountiful, and there was always enough for everyone to eat. One day, the High King of Ireland died, and left his kingdom to his three sons. Their names were Mac Cuill, Mac Cecht and Mac Gréine. The three of them could not agree on how best to divide the land between them, and they quarrelled bitterly, until the Tuatha de Dannan were on the brink of war. At this time, far away in Spain, there lived a wise old man named Ith Espaine. He often stood on his high tower, looking out over the sea. One day, he thought he could see an island in the distance; a place of high mountains and green forests. Ith told his brother and his nephews about this land that he could see, but they thought that he was looking at storm-clouds, and laughed at him. But every day that Ith looked, he could see the island a little clearer, and at last he became determined to sail there if he could. Ith gathered his men, and set sail. When he and his men reached Ireland at last, Ith marvelled at the wonderful land he saw. He made his way to Tara, where Mac Cuill, Mac Cecht and Mac Gréine were arguing still. They welcomed Ith and his men, and because of his age, they decided to ask his council. Ith told them that he best thing to do would be to follow the laws and customs of the land, because from what he could see, those customs must be very good indeed, for the land to be as perfect as it was. Ith went on, praising everything about Ireland, and speaking in glowing terms of everything that he had seen there. But he being a foreigner, it made them uneasy to hear him talk about Ireland with such praise. They decided he must have come as a conqueror, and so without further provocation, the Three Kings of Ireland killed poor Ith Espaine. When Ith’s men brought word of his death back to his grandson Mil, he and his three sons gathered an army and set sail for Ireland to get justice for Ith. Mil died on the voyage, but his sons Amergin, Eremon and Eber Donn, honoured their father’s wishes and continued on their way. Now, Amergin was a powerful druid, and when they came to the shore of Ireland, Amergin sang a song announcing his presence, and all the skills of magic and respect for nature that he had. The sons of Mil journeyed to Tara and announced to the three kings of the Tuatha de Dannan that they had come to exact revenge for their great-grandfather’s murder. The three kings asked for three days, during which time they would decide whether to abandon Ireland, to fight or to submit. Amergin, being the wisest among them, agreed to this condition, and they retreated on their ships nine waves beyond the shores and waited there, so that there could be no chance of their planning anything underhanded. The druids of the Tuatha de Dannan were not so honourable, and they sang up a storm. They called down a mist to scatter the ships so that they would not be able to land again. When the storm blew up, Amergin suspected that it was magical; he sent one of his men up the mast to see the storm from above. The man fell from the mast to his death, but as he fell he managed to call out to Amergin that it was calm above: there was no storm. From this, Amergin knew for sure that it was not natural. Now Amergin’s druidic powers were a match for the de Dannan druids, and he sang a counter-song against their songs that quieted the storm. Furious at the treachery of the Tuatha de Dannan, the Milesians decided not to wait till the three days were up, but to land immediately. After the storm died down, one of the men, Dunn, was so enraged that he began to talk about how he would kill all of the Tuatha de Dannan, exulting in the thought of the slaughter they would wreak. As he spoke these hateful words, the storm blew up again, stronger than ever! The Sons of Mil had to make an anti-clockwise trip around Ireland before they could land by sailing up the Boyne. On their way to the Plain of Tailtiu, they met with the three Queens of the Tuatha de Dannan, one after another. The Queens, Banba, Eriu and Fodla, promised that they would help the sons of Mil, if in exchange they named the land after them. Amergin agreed to each Queen’s demand, and that was why, in ancient times, Ireland had three names, though only Eriu’s survives today. On the plain of Tailtiu, the sons of Mil met the Tuatha de Dannan in a great and terrible battle. The three kings of the Tuatha de Dannan were slaughtered, and then the sons of Mil slaughtered their wives. The Tuatha de Dannan’s forces were routed, and they fled all the way to the sea, with the sons of Mil in pursuit, killing and slaughtering all they could get their hands on. After the battle, the Tuatha de Dannan were defeated beyond any hope of recovery. They decided not to stay with the sons of Mil, who were dividing Ireland in half so that Eremon and Eber Donn could rule it together. Instead of staying where they would have to pay taxes and tributes to the conquerors, they retreated, and shrouded themselves in invisibility, taking all of their magic with them. They took ownership of the hills, the forests and the waterways of Ireland, where they lived forever more.